To track the relative attractiveness of the U.S. stock market as an investment, I use the set of leading equity market indicators as show in the table below. The signals are measured as of the end of trading on 3/31/2014. 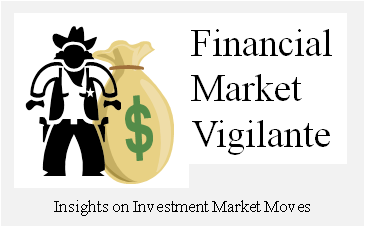 Throughout the 1st quarter of 2014, the major US stock market indexes (DIA) (SPY) were increasingly becoming less attractive investment alternatives. The trend in the market signals were pointing to potential market instability progressing into the spring and summer of 2014 due to the unsustainable basis for the market valuation and increasing international unrest. This assessment is based on ample evidence that the primary basis for holding the record stock index highs at the end of March was a Fed driven shortage of US dollar investment alternatives, and likewise, as the Fed began to withdraw their bond buying support the Q1, the stock market performance lagged. With the advent of much higher international tension, the US equity market is precariously perched for a downturn if the economic war between east and west escalates. The DOW posted a quarterly loss in Q1 2014, which is a troubling sign. But the most important leading indicator to watch historically with respect to the performance of the DOW is its year over year performance at month end close. At the end of Q1, the performance was still decidedly positive at 12.9%, thus the signal is still shown as green in the table. However, the historical performance of this signal shows that it breaks down quickly, usually within 3 months of an all-time high. And, the breakdown usually requires only a small drop in the DOW for a year over year loss to be recorded. This situation is precisely the position the market faces at the beginning of Q2 2014. Additional evidence of strengthening headwinds for the market can be found in the flattening of the Treasury yield curve. The front end of the Treasury curve has been distorted for years by the Fed zero bound interest rate policy. Historically when Fed policy is tightening and the market is approaching a breakdown point, the 10 / 2 Treasury spread shows a flattening and in some cases an inversion. As the stock market begins to unwind, the 2 year usually spikes higher in price, lower in yield as stock investors unwind positions and parked funds in short duration Treasuries. Presently the Fed, and implicitly the Obama White House, is signaling through Yellen’s speeches that they intend to keep Treasury short term rates low indefinitely into the future, obscuring the underlying risk sentiment in the market. Despite Fed Speak to the contrary, controlling the entire Treasury yield maturity spectrum is going to be difficult, if not impossible in an environment in which the Fed is reducing bond purchases to a more typical $5B-$10B a month. That is why the 10 / 5 Treasury spread has become the likely telling indicator of market risk over the intermediate term. There is still room for flattening to continue, as a 0% spread would be more typical of a sustained market downturn approaching. However, the fact that the spread has contracted 40 basis point to 1% since November 2013 and Fed bond buying is on the decline means this signal is very likely to be a precursor to the next market breakdown. Rising Geopolitical Tension a Response to Fed Policy? The first quarter of 2014 witnessed what essentially became an unobstructed siege of the Crimean Peninsula by Russia, with little to no push-back from either the United States or Europe. The heightened level of Russian provocation stirring geo-political tension raises interesting questions for investors to consider when assessing the U.S. stock market for storing wealth. The first is whether the increased risk of economic disruption is actually priced into the market. The answer to this question is probably not. But equally important is whether the weak U.S. position in the face of the aggressive Russian actions is actually going to inflame the situation even more so as time progresses. An analysis of the situation from an information standpoint as portrayed by major media outlets leads to a conclusion that Russia is weak economically because of its dependency on energy to produce reserves to conduct foreign trade, and Putin is power hungry to restore mother Russia to previous territorial borders. As an investor, I am more concerned about the economic rational rather than the Machiavellian tendencies of a particular world leader. And the economic facts are that the current Fed policy which has utilized quantitative easing at unprecedented levels has most visibly strained emerging markets, Russia being one of many. Meanwhile, the western alliance of the U.S., Europe and Japan have all liquefied a major portion of their current high government spending levels, while beefing up the reserve positions in the major financial institutions which act as the broker dealers for the U.S. treasuries sold on the open market. This assessment should not be construed as a defense for the aggressive actions by our historical adversary. However, what should investors expect when the U.S. monetary policy and the western alliance is winning so decisively in the relative battle for economic advantage? Conflict. The push back in this scenario from Russia should really come as no surprise to anyone. Energy exporting countries in the world have historically taken action to drive the price of crude oil up in order to command a higher return when US monetary policy is deemed overly aggressive. But in the present scenario, the ability of the energy block to drive crude prices higher is being hindered by U.S. energy policy which is pushing E&P shale drilling activities in the Bakken and other locations is keeping a lid on U.S. export demand on the margin, and as a consequence oil price levels. As seen in the table of relative indicators, the year over year change in oil price levels remains muted at 3.4%, well below the 6.5% increase in U.S. M2 money supply. Historically when the stock market is ripe to roll-over, research shows that it almost always coincides with a disruption from an international source which forces the Federal Reserve to respond with tighter credit conditions to maintain the value of the U.S. dollar. The most reliable signal of deteriorating conditions that instigate Fed intervention is the oil market because it clearly shows the relative strength of the non-western alliance currencies to the USD. However, an oil spike is currently viewed as a highly unlikely event by investment analysts throughout the U.S. market. In fact, Barron’s ran a cover page article over the past weekend entitled Here Comes $75 Oil. Personally I think the information and the basis for the expectation are suspect; nonetheless it is the current market expectation. The impact of the growing conflict between east and west on U.S. stocks should be expected to become more visible in the coming months. Buyers beware. 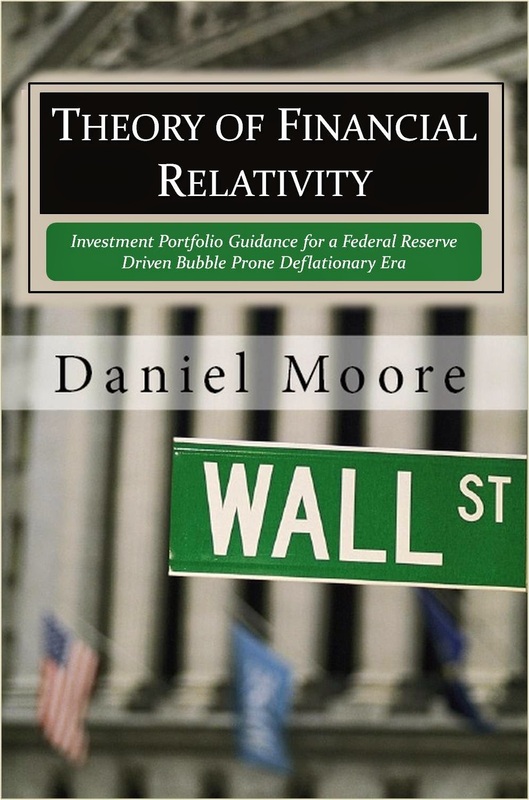 To help investors looking for a system to track the relative attractiveness of the U.S. equity market, the Financial Relativity Index has been created based on a set of leading indicators derived from the research contained in the book, Theory of Financial Relativity. The index is a heuristic used to gauge the relative attractiveness of investing in stocks at a given time based on the interaction of major market forces and the resulting impact on the rate of change in the price levels of stocks (DOW Signal), money (Interest Rate Spreads) and energy (Oil). 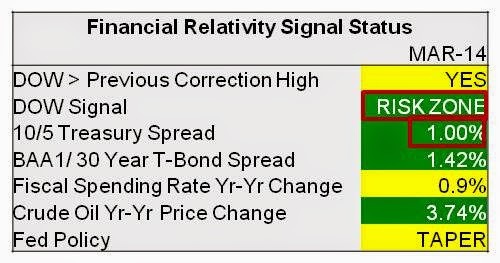 All of the signals in the multivariate model possess characteristics which have a high probability of being exhibited prior to a sustained equity market downturn accompanied by economic recession; and likewise remain within certain parameters when the equity market is more attractive as an investment such as during a post recession rebound or an economic expansion.